1961 I was born in Kobe in 1961. 1980 I get baptized at the Tachikawa church. 2010 I am ordained as a priest in St. Mary’s Cathedral, Tokyo. 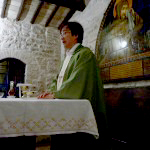 2010~2012.3 It is inaugurated as curate of the Meguro church. 2012.4~ It is inaugurated as parish priest of the Kiyose church.